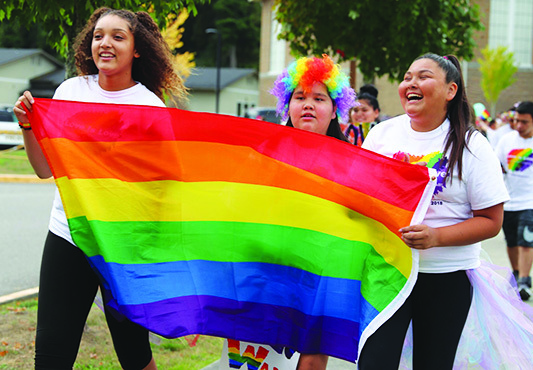 The Tulalip Youth Council hosted the very first Pride Walk in the Tulalip-Marysville community on September 29. Over one-hundred citizens gathered at the Francis J. Sheldon Gymnasium to celebrate and show love and support to the LGBTQ community. As people began to arrive, a group of youngsters raised a rainbow colored flag on the pole located outside the gym. Meanwhile on the inside, participants constructed a number of signs that read messages such as Love Wins and Love is Love. 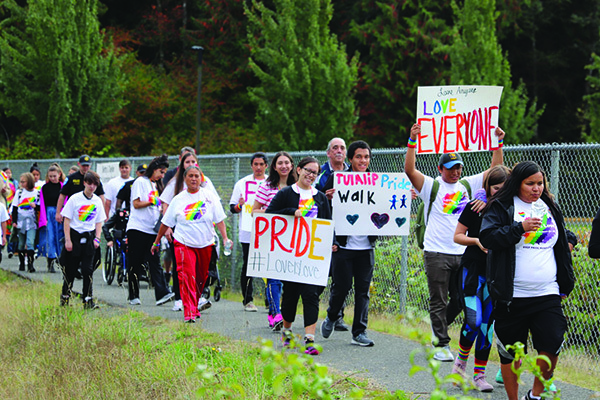 Participants began their two-mile trek from the gym to the four-way intersection located in front of the Tulalip Bingo Hall and Quil Ceda Village administration. With miniature pride flags and their posters proudly displayed overhead, the community members were met with an overwhelming response from local drivers on their daily commute, who emphatically honked their horns as they passed the crowd. Tribal members and local leaders showcased large smiles during the walk, happy to support their two-spirited loved ones. 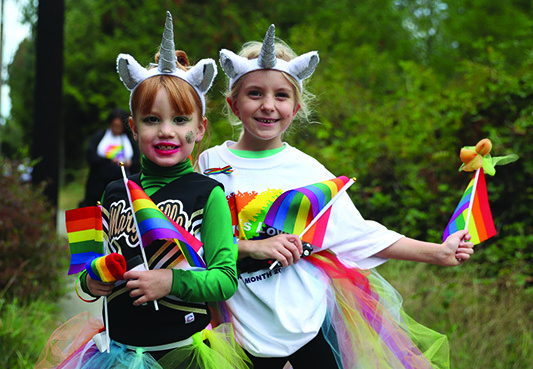 Jessica explained that the Youth Council was inspired to begin the Pride Walk back in June during national pride month. Thanks to a few months of planning and organizing, the walk was a great success. A large turnout of youth showed that this is an important issue amongst the future generations as they continue to build each other up and encourage their friends to be who they are. 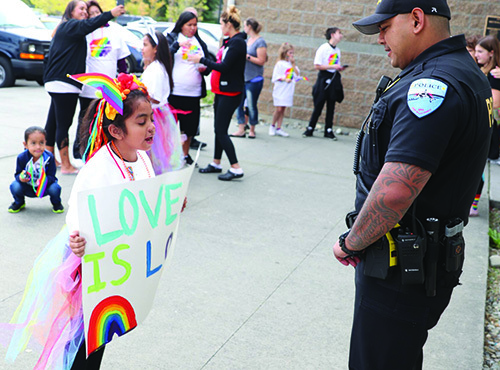 The Seattle Clear Sky Native Youth Council of the Urban Native Education Alliance (UNEA) traveled north to show solidarity with the Tulalip Youth Council and the LGBTQ community. The Clear Sky Youth Council previously wrote a resolution in support of two-spirited individuals and wants to continue offering that support at marches and rallies. After the walk, the community met once again in the gym. This time, however, the walkers enjoyed pizza and good conversation before participating in a jam session to close out what may go down as a historic day for the Tulalip and Marysville community. 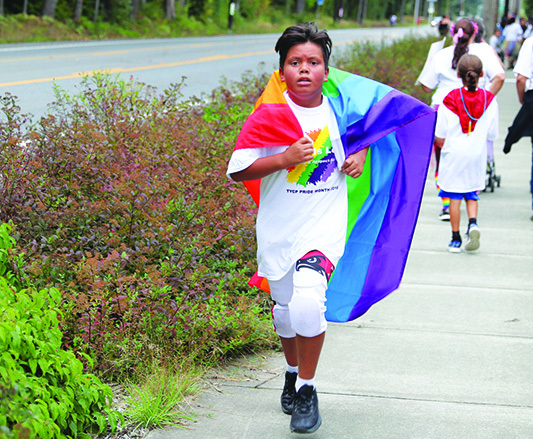 The Tulalip Youth Council looks to continue the Pride Walk annually, but wishes to make the event coincide with national pride month in June. For further details, please contact Tulalip Youth Services at (360) 716-4909. 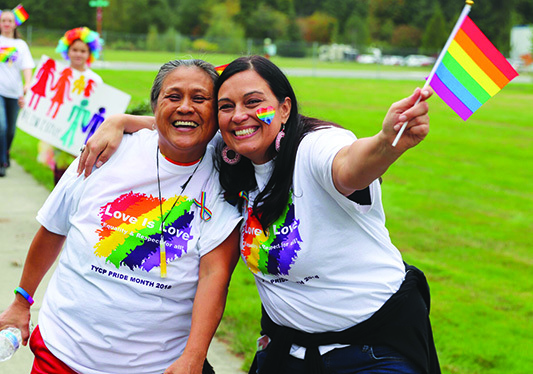 This entry was posted in News, Top Story, Tulalip News and tagged Pride, Pride Walk, Tulalip, Tulalip Tribes, Tulalip Youth Council by Kim Kalliber. Bookmark the permalink.